While the HTML form of HTML5 bears a close resemblance to SGML and XML, it is a separate language with its own parsing rules. Authors interested in using SGML tools in their authoring pipeline are encouraged to use XML tools and the XML serialization of HTML5. Conformance checkers must report at least one parse error condition to the user if one or more parse error conditions exist in the document and must not report parse error conditions if none exist in the document. Conformance checkers may report more than one parse error condition if more than one parse error conditions exist in the document. Conformance checkers are not required to recover from parse errors. The input to the HTML parsing process consists of a stream of Unicode characters, which is passed through a tokenisation stage (lexical analysis) followed by a tree construction stage (semantic analysis). The output is a Document object. In the common case, the data handled by the tokenisation stage comes from the network, but it can also come from script, e.g. using the document.write() API. 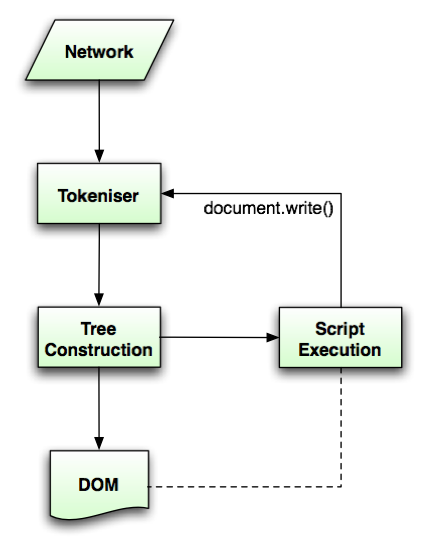 There is only one set of state for the tokeniser stage and the tree construction stage, but the tree construction stage is reentrant, meaning that while the tree construction stage is handling one token, the tokeniser might be resumed, causing further tokens to be emitted and processed before the first token's processing is complete. The stream of Unicode characters that consists the input to the tokenisation stage will be initially seen by the user agent as a stream of bytes (typically coming over the network or from the local file system). The bytes encode the actual characters according to a particular character encoding, which the user agent must use to decode the bytes into characters. User agents must use the following algorithm (the encoding sniffing algorithm) to determine the character encoding to use when decoding a document in the first pass. This algorithm takes as input any out-of-band metadata available to the user agent (e.g. the Content-Type metadata of the document) and all the bytes available so far, and returns an encoding and a confidence. The confidence is either tentative or certain. The encoding used, and whether the confidence in that encoding is tentative or confident, is used during the parsing to determine whether to change the encoding. If the transport layer specifies an encoding, return that encoding with the confidence certain, and abort these steps. Advance the position pointer so that it points at the next 0x09, 0x0A, 0x0B, 0x0C, 0x0D, 0x20, or 0x2F byte (the one in sequence of characters matched above). Get an attribute and its value. If no attribute was sniffed, then skip this inner set of steps, and jump to the second step in the overall "two step" algorithm. If the attribute's name is neither "charset" nor "content", then return to step 2 in these inner steps. If the attribute's name is "charset", let charset be the attribute's value, interpreted as a character encoding. Otherwise, the attribute's name is "content": apply the algorithm for extracting an encoding from a Content-Type, giving the attribute's value as the string to parse. If an encoding is returned, let charset be that encoding. Otherwise, return to step 2 in these inner steps. If charset is a UTF-16 encoding, change it to UTF-8. If charset is a supported character encoding, then return the given encoding, with confidence tentative, and abort all these steps. Otherwise, return to step 2 in these inner steps. Advance the position pointer so that it points at the next 0x09 (ASCII TAB), 0x0A (ASCII LF), 0x0B (ASCII VT), 0x0C (ASCII FF), 0x0D (ASCII CR), 0x20 (ASCII space), or 0x3E (ASCII '>') byte. Advance the position pointer so that it points at the first 0x3E byte (ASCII '>') that comes after the 0x3C byte that was found. If the byte at position is one of 0x09 (ASCII TAB), 0x0A (ASCII LF), 0x0B (ASCII VT), 0x0C (ASCII FF), 0x0D (ASCII CR), 0x20 (ASCII space), or 0x2F (ASCII '/') then advance position to the next byte and redo this substep. If the byte at position is 0x3E (ASCII '>'), then abort the "get an attribute" algorithm. There isn't one. Append the Unicode character with codepoint b+0x20 to attribute name (where b is the value of the byte at position). Spaces. If the byte at position is one of 0x09 (ASCII TAB), 0x0A (ASCII LF), 0x0B (ASCII VT), 0x0C (ASCII FF), 0x0D (ASCII CR), or 0x20 (ASCII space) then advance position to the next byte, then, repeat this step. If the byte at position is not 0x3D (ASCII '='), abort the "get an attribute" algorithm. The attribute's name is the value of attribute name, its value is the empty string. Advance position past the 0x3D (ASCII '=') byte. Value. If the byte at position is one of 0x09 (ASCII TAB), 0x0A (ASCII LF), 0x0B (ASCII VT), 0x0C (ASCII FF), 0x0D (ASCII CR), or 0x20 (ASCII space) then advance position to the next byte, then, repeat this step. Otherwise, if the value of the byte at position is in the range 0x41 (ASCII 'A') to 0x5A (ASCII 'Z'), then append a Unicode character to attribute value whose codepoint is 0x20 more than the value of the byte at position. Otherwise, append a Unicode character to attribute value whose codepoint is the same as the value of the byte at position. Append the Unicode character with codepoint b+0x20 to attribute value (where b is the value of the byte at position). Advance position to the next byte. Append the Unicode character with the same codepoint as the value of the byte at position) to attribute value. Advance position to the next byte. Append the Unicode character with codepoint b+0x20 to attribute value (where b is the value of the byte at position). Append the Unicode character with the same codepoint as the value of the byte at position) to attribute value. Otherwise, return an implementation-defined or user-specified default character encoding, with the confidence tentative. In non-legacy environments, the more comprehensive UTF-8 encoding is recommended. Due to its use in legacy content, windows-1252 is recommended as a default in predominantly Western demographics instead. Since these encodings can in many cases be distinguished by inspection, a user agent may heuristically decide which to use as a default. User agents must at a minimum support the UTF-8 and Windows-1252 encodings, but may support more. When comparing a string specifying a character encoding with the name or alias of a character encoding to determine if they are equal, user agents must ignore the all characters in the ranges U+0009 to U+000D, U+0020 to U+002F, U+003A to U+0040, U+005B to U+0060, and U+007B to U+007E (all whitespace and punctuation characters in ASCII) in both names, and then perform the comparison case-insensitively. For instance, "GB_2312-80" and "g.b.2312(80)" are considered equivalent names. When a user agent would otherwise use an encoding given in the first column of the following table, it must instead use the encoding given in the cell in the second column of the same row. Any bytes that are treated differently due to this encoding aliasing must be considered parse errors. Support for UTF-32 is not recommended. This encoding is rarely used, and frequently misimplemented. Given an encoding, the bytes in the input stream must be converted to Unicode characters for the tokeniser, as described by the rules for that encoding, except that the leading U+FEFF BYTE ORDER MARK character, if any, must not be stripped by the encoding layer (it is stripped by the rule below). Bytes or sequences of bytes in the original byte stream that could not be converted to Unicode characters must be converted to U+FFFD REPLACEMENT CHARACTER code points. All U+0000 NULL characters in the input must be replaced by U+FFFD REPLACEMENT CHARACTERs. Any occurrences of such characters is a parse error. U+000D CARRIAGE RETURN (CR) characters, and U+000A LINE FEED (LF) characters, are treated specially. Any CR characters that are followed by LF characters must be removed, and any CR characters not followed by LF characters must be converted to LF characters. Thus, newlines in HTML DOMs are represented by LF characters, and there are never any CR characters in the input to the tokenisation stage. The next input character is the first character in the input stream that has not yet been consumed. Initially, the next input character is the first character in the input. The insertion point is the position (just before a character or just before the end of the input stream) where content inserted using document.write() is actually inserted. The insertion point is relative to the position of the character immediately after it, it is not an absolute offset into the input stream. Initially, the insertion point is uninitialized. If the new encoding is identical or equivalent to the encoding that is already being used to interpret the input stream, then set the confidence to confident and abort these steps. This happens when the encoding information found in the file matches what the encoding sniffing algorithm determined to be the encoding, and in the second pass through the parser if the first pass found that the encoding sniffing algorithm described in the earlier section failed to find the right encoding. If all the bytes up to the last byte converted by the current decoder have the same Unicode interpretations in both the current encoding and the new encoding, and if the user agent supports changing the converter on the fly, then the user agent may change to the new converter for the encoding on the fly. Set the document's character encoding and the encoding used to convert the input stream to the new encoding, set the confidence to confident, and abort these steps. Otherwise, navigate to the document again, with replacement enabled, and using the same source browsing context, but this time skip the encoding sniffing algorithm and instead just set the encoding to the new encoding and the confidence to confident. Whenever possible, this should be done without actually contacting the network layer (the bytes should be re-parsed from memory), even if, e.g., the document is marked as not being cacheable. Initially the insertion mode is "initial". It can change to "before html", "before head", "in head", "in head noscript", "after head", "in body", "in table", "in caption", "in column group", "in table body", "in row", "in cell", "in select", "in select in table", "in foreign content", "after body", "in frameset", "after frameset", "after after body", and "after after frameset" during the course of the parsing, as described in the tree construction stage. The insertion mode affects how tokens are processed and whether CDATA blocks are supported. Seven of these modes, namely "in head", "in body", "in table", "in table body", "in row", "in cell", and "in select", are special, in that the other modes defer to them at various times. When the algorithm below says that the user agent is to do something "using the rules for the m insertion mode", where m is one of these modes, the user agent must use the rules described under that insertion mode's section, but must leave the insertion mode unchanged (unless the rules in that section themselves switch the insertion mode). When the insertion mode is switched to "in foreign content", the secondary insertion mode is also set. This secondary mode is used within the rules for the "in foreign content" mode to handle HTML (i.e. not foreign) content. If node is an element from the MathML namespace, then switch the insertion mode to "in foreign content", let the secondary insertion mode be "in body", and abort these steps. Initially the stack of open elements is empty. The stack grows downwards; the topmost node on the stack is the first one added to the stack, and the bottommost node of the stack is the most recently added node in the stack (notwithstanding when the stack is manipulated in a random access fashion as part of the handling for misnested tags). The html node, however it is created, is the topmost node of the stack. It never gets popped off the stack. The following HTML elements have varying levels of special parsing rules: address, area, base, basefont, bgsound, blockquote, body, br, center, col, colgroup, dd, dir, div, dl, dt, embed, fieldset, form, frame, frameset, h1, h2, h3, h4, h5, h6, head, hr, iframe, img, input, isindex, li, link, listing, menu, meta, noembed, noframes, noscript, ol, optgroup, option, p, param, plaintext, pre, script, select, spacer, style, tbody, textarea, tfoot, thead, title, tr, ul, and wbr. The following HTML elements introduce new scopes for various parts of the parsing: applet, button, caption, html, marquee, object, table, td and th. The following HTML elements are those that end up in the list of active formatting elements: a, b, big, em, font, i, nobr, s, small, strike, strong, tt, and u. Otherwise, if node is a table element, terminate in a failure state. Initially the list of active formatting elements is empty. It is used to handle mis-nested formatting element tags. Append clone to the current node and push it onto the stack of open elements so that it is the new current node. Replace the entry for entry in the list with an entry for clone. If the entry for clone in the list of active formatting elements is not the last entry in the list, return to step 7. Initially the head element pointer and the form element pointer are both null. The scripting flag is set to "enabled" if the Document with which the parser is associated was with script when the parser was created, and "disabled" otherwise.